Born in England, architect Robert W. Gibson began his American career in upstate New York. His receiving a major New York City commission--the designing of the United States Trust Company building--may have been what prompted him to move his operation to Manhattan. On March 10, 1888 The Record & Guide announced "Architect R W. Gibson of Albany, has opened offices in the Potter building. It will be remembered that Mr. Gibson received the commission for the new building on Wall street for the United States Trust Company." Gibson would soon receive another commission; albeit one not quite so impressive. 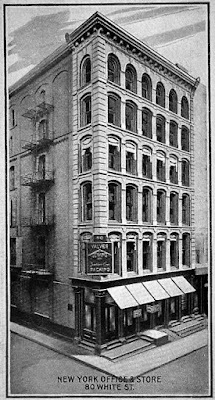 Banker and politician B. F. Wheelright had purchased the old 23-foot wide building at No. 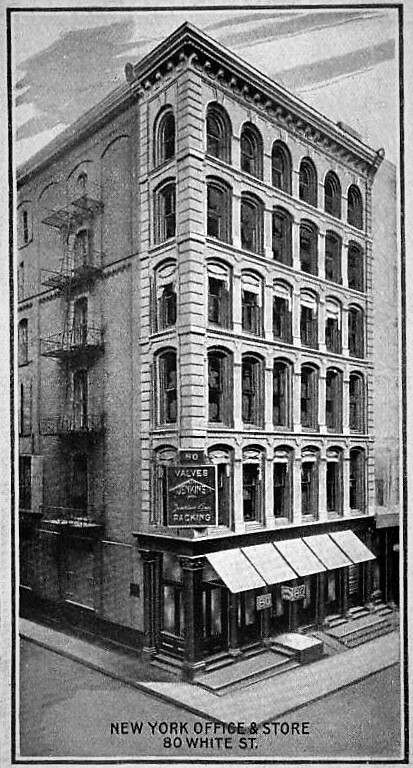 88 White Street in 1880. Now, early in 1889 his estate hired Gibson to design a modern factory and store building on the site. The architect filed plans on June 14 for a "five-story brick store." The projected cost was $30,000, or about $824,000 today. 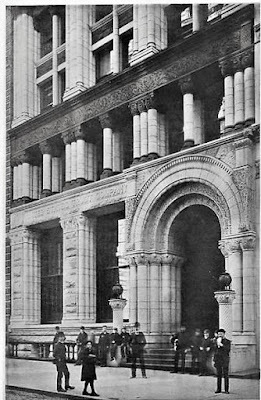 As he had done with the United States Trust Company project, he turned to the Romanesque Revival style--this time a much scaled back version. He faced No. 88 with Roman brick and softened the edges with bull-nosed, or curved bricks. 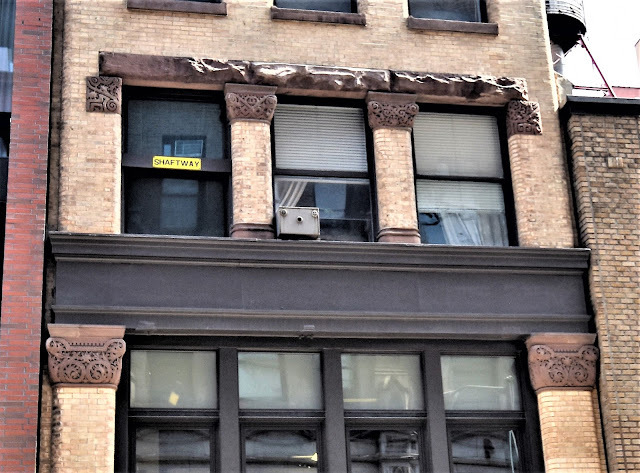 The squat pilasters of the third floor wore complex, carved capitals and upheld a chunky undressed lintel. They gave way to more formal, two-story piers at the fourth and fifth which terminated in decorous capitals executed in brick. Brick piers wear brownstone capitals, carved with intricate Romanesque designs. The three massive undressed stones that make up the joint lintel of the third floor openings add to the medieval flavor. The building's first tenant seems to have been Potter & Pearson, manufacturers of oil cloth. The waterproof fabric was widely popular and used in items as far ranging as floor mats (decorated to imitate carpeting and placed under dining and kitchen tables), the linings of trunks, and carriage upholstery. Edward Silas Pearson was born in 1856 and had begun his career in 1878 with Barlow Stevens, an oil cloth jobber. His future with the firm was assured when he married Stevens's daughter. Following Stevens's death, Pearson took over the firm, bringing in two partners, including a long-time employee Louis J. Potter. The partnership took on the name of Potter, Lindsay & Pearson. By the time it moved into No. 88 White Street, Lindsay was out and the firm was Potter & Pearson. Around the turn of the century the company added a new floor covering material to its line--linoleum. It remained in the building until around 1910 when it relocated to East 16th Street. That year in December the newly incorporated E. R. Northrop leased the fifth floor. The hardware and sportswear dealer added "packing, gum and fibrous" to its offerings in 1913. It would remain in the building at least through 1916. By then the automobile had become a noticeable presence on America's roadways. Automobilists, as owners were called, customized their motorcars with any number of accessories; and all of them could be found at B. E. Mfg. Co., which called No. 88 home by 1914. The seeming inexhaustible list of items it manufactured included collapsible buckets (for those unfortunate motor fires); spark plug cases; covers for the entire automobile or parts like the lamps, radiator, hood, and spare tire; and "starting crank holders." The description of that accessory read "leather strap and holder to prevent starting crank swinging or dropping down." Also available were "motorists' leggings," door protectors ("leather or fabric pads to protect the finish of the door"), cushion back rests, wash aprons, bags or rolls for tools, reflector sockets and a number of other items. In the meantime, Jenkins Bros., manufacturers of pressure valves, had occupied the large building steps away at No. 80 White Street for years. By 1915 it increased its square footage by leasing space in No. 88 as an annex. The firm was organized by Nathaniel Jenkins as Jenkins Bros. in 1864. Since the earliest days the firm had held patents--the original being the renewable Jenkins Disc--which made its valves unique. The firm's immense operation (it had a massive plant in Bridgeport, Connecticut and branch offices in Chicago, Philadelphia and Boston) was outstandingly successful. In February 1924 it reported its net profits for the preceding year at $732,635--around $10.5 million today. Another hardware dealer, Burger & Baumgard, was in the building by 1916. Within the next five years they had added a new commodity to its line, the electric freezer. No. 88 continued to house a variety of factories and shops through the rest of the century, like the Dublin-based Murphy & Stevenson, linen merchants, here after the World War I years. An interior renovation was done in 1962; but the spaces were still for "warehouse and workshop" uses. As was often the case in Tribeca at the end of the 20th century, the old lofts were appropriated by artists as studio-residential spaces whether or not they were legal. The owners of No. 88 corrected the situation in 2003 when it listed its intended renovations as "legalization of interim multiple dwelling." Five years later there was one apartment on each of the top three. An exterior renovation, completed in 2014, removed and replaced the old parapet and restored the brownstone elements. Although the building is not protected by landmark status, the changes were sympathetically executed. Considering that it was neither an important commission nor a significant structure, Gibson's conscientious use of materials and his skillful handling of the style leaves us with a striking commercial structure.